Bagels are easy and fun to make at home. 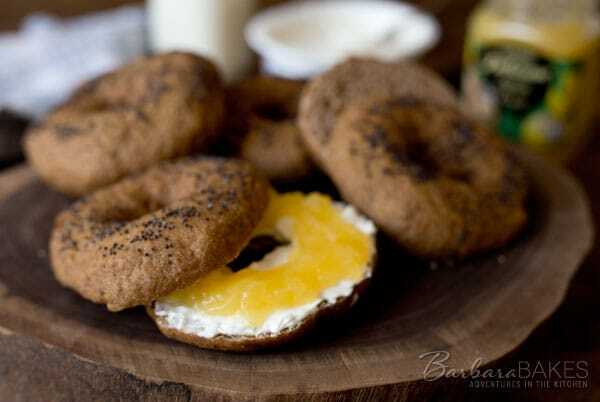 I served these Lemon Poppy Seed Sprouted Wheat Bagels with cream cheese and lemon curd. Recently, my good friends Becky, Vintage Mixer, and Ruthie, Cooking with Ruthie came over and we hung out in my kitchen making bagels. We thought it would be fun if we each picked a different bagel flavor and divided the dough in to thirds. 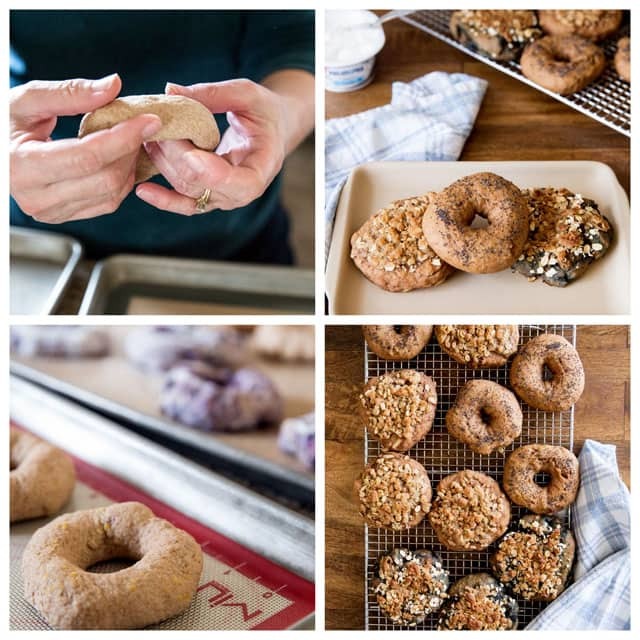 Becky decided to make Sprouted Whole Wheat Bagel Recipe with Wild Blueberries, Ruthie made Apple Streusel Sprouted Whole Wheat Bagels, and I made Lemon Poppy Seed Sprouted Wheat Bagels. Becky was in charge of choosing a recipe for us to try, and she was drawn to recipes using sprouted wheat flour. If you’re like me, you may be wondering what sprouted flour is and what are the benefits. This article, What the heck is sprouted flour?, in the Huffington Post does a good job of explaining it. I bought the sprouted wheat flour at Whole Foods. I was expecting a heavy whole wheat flour, but I was impressed how light it was. The bagels baked up light and airy as well. Often when I make something healthier, I feel like I can indulge a little too. So I decided to spread my bagels with reduced fat cream cheese and lemon curd. It was the perfect match for my lemon poppy seed bagels. I usually make homemade lemon curd, but this time I picked up a jar at the market. The bagel recipe has quiet a few steps, but they’re all easy. So don’t let that intimidate you, and give them a try soon. 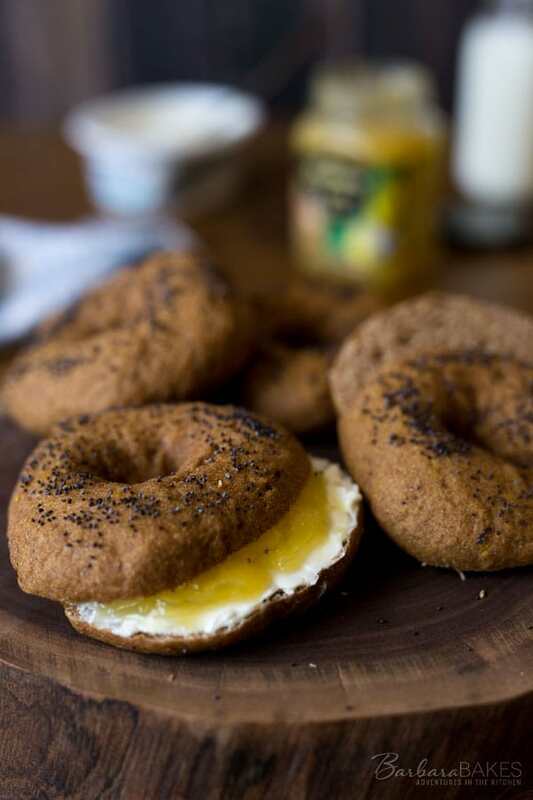 Be sure and visit Becky, Vintage Mixer, and Ruthie, Cooking with Ruthie for their bagel recipes. In the bowl of a stand mixer, using the paddle attachment, combine 3 cups flour, vital wheat gluten, salt and yeast. In a small bowl whisk together water and honey. Add to flour mixture and blend at low speed until moistened. Add lemon zest and beat 3 minutes at medium speed. Switch to the dough hook and mix in the remaining flour a little at a time, to make a soft, slightly sticky dough, add more or less flour as needed. Knead the dough for 5 minutes until smooth and elastic. Place dough in lightly oiled bowl and turn to grease top. Cover; let rise in warm place until double about 90 minutes. Divide the dough into 12 pieces. (9 pieces for larger bagels.) Form each piece into a ball. Cover the balls with a damp towel and allow them to rest for 20 minutes. Line a sheet pan with a Silpat or parchment paper sprayed with non-stick cooking spray. Poke a hole in the center of each ball of dough with your thumb. Rotate the dough as you gently stretch it to widen the hole to 2-inches in diameter. Place on prepared baking sheet, at least 1 inch apart. Lightly oil tops and cover loosely with plastic wrap. Allow bagels to rest for 30 to 60 minutes, until just beginning to rise. To see if bagels are ready, drop one into a bowl of water. If it floats to the surface within 15 seconds, they’re ready for the next step. Preheat oven to 425°. Line a second baking sheet with a Silpat or parchment paper sprayed with non-stick cooking spray. Sprinkle with cornmeal. Fill a large stock pot with 6 inches of water and bring to a boil over high heat. Reduce the heat so water is gently simmering. Add baking soda. Drop bagels into the water two or three at a time and simmer for 30 seconds on each side. Use a slotted spoon to remove bagels from water and place on prepared baking sheet, rounded side up. Sprinkle poppy seeds over bagels and repeat with remaining bagels. Bake 12 minutes or until golden brown. Remove from oven and cool on a wire rack completely before serving. Wonderful! I wish sprouted whole wheat flour was available here.